Tough, clear, and mounts in an instant, holding tight for a crystal clear weatherproof bond. For interior or exterior use. Bonds to brick, concrete, stone, glass, metal, plastic, tile and wood etc. 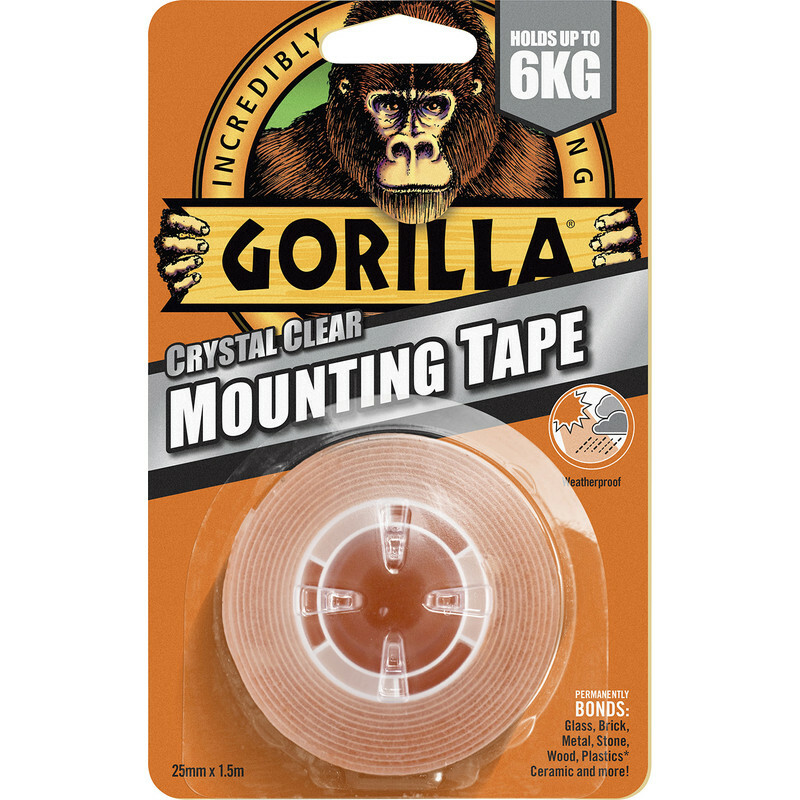 Gorilla Double Sided Mounting Tape 25.4mm x 1.52m is rated 3.7 out of 5 by 23. Rated 1 out of 5 by Elsa from Doesn't stick I bought this to stick some conduit in place, but it has no stick at all, doesn't stick to my fingers, the conduit or the wall. Give this a miss. Rated 3 out of 5 by Nash2018 from Not convinced..... I bought this to stick a very light piece of wooden trim 450mm wide by 25mm high by 3mm thick to the metal body of a venetian blind. One piece of tape measuring about 25mm by 35mm was cut for each end and the trim applied. It seemed to work well, but after 20 minutes one end had fallen off! Not that impressed. Rated 5 out of 5 by Scaleyback from Excellent adhesion When using to hang item be very sure the item is perfectly positioned. Once adhered to tape, that is it. Rated 3 out of 5 by Allyg from Very sticky I bought this to stick a spice rack onto a cupboard door , but it only lasted a few minutes then fell down. The spice bottles were too heavy and too long , the info on the pack did say that anything longer than a specific size wouldn’t work , but I had to try . Really easy to work with . I’m sure that in the right circumstances this product would work really well ! !